Both of these units 210006 & 210007 have the FDA 510K clearance & approval. UL 544 - (USA) Underwriters Laboratory covering electrical and product safety. CSA Class 8721 01 - (Canada) Canadian Standards Association covering electrical and product safety. The 210006 is approved for use in Canada and carries a CSA mark as well as a TSSA for the pressure vessel. Please provide this information to any local inspectors who may be asking. The CSA Certificate is attached. ESCHLE - (UK) Electrical Safety Code for Hospital Laboratory Equipment. BS 3970 Part 4 - British Standard for autoclaves. Pressure vessel complies. IEC 601 - Electrical and product safety standard. DIN 58946 - Part 8. Type testing for microbiological performance. For You If You Are The 1st TIme User. For You If You Need A Sterilizer For A Back Up. 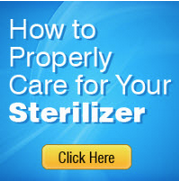 For You If You Have Multiple Offices And In A Particular Office You Have Only Litttle Need For A Sterilizer. 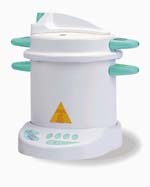 Overnight shipping of replacement parts, or replacement sterilizer is available. 80% of the time we are able to help you live .. right on the phone. Check out what some of our customers are saying about our history of perfectionism. is one of the worlds largest selling and cost effective automatic autoclaves available. Sold in 80 countries worldwide, it has gained an enviable reputation for reliability, durability and quality. One fact alone proves that the Prestige Medical 2100 is committed to quality-a Lifetime guarantee on the heating element. Mechanical interlock system prevents lid from being removed while pressure remains in the chamber. Gasket offset device prevents pressure build up if lid is not correctly fitted. At only 9.9 pounds net weight with chamber size of approximately 8" x 9", the 2100 is ideal for most sterilization applications. For the assurance of quality each autoclave is computer tested and issued with a test certificate showing the temperature time cycle. Application Specific Integrated Circuit (ASIC) is used to improve performance and reliability. Simple 1-step operation starts the fully automatic cycle. Light sequence indicators show "power to the unit"-"cycle in progress"-"sterilization cycle complete". Electronic detectors turn off power if there is insufficient water charge. Chamber diameter: 8.26" 8.26" 8.26" 8.26"
Chamber height: 9.29" 9.29" 12.91" 12.91"
Max width - overall: 13.38" 13.38" 13.38" 13.38"
Max height - overall: 13.18" 13.18" 16.53" 16.53"
Max inst' length: 8.97" 8.97" 11.47" 11.47"